I took it on Figureoa Street in downtown Los Angeles. Oh WOW! Love the color and your composition here. Welcome back! Wow, is the right word for this fabulous photo! Love the vantage point of this photo. Location??? The fold on is charismatic! Very effective photo - great impact. Glad to see you back - I was looking only yesterday, to see if you'd posted recently. Oh the right picture for the rainy autumn: beautiful and colorful! Is one umbrella on strike? Terrific image for your re-emergence. I missed your interpretations while you were away. Thank you all for your comments. It is nice to be back. For those who asked, I took this shot on Figureoa Street in downtown Los Angeles. Yes...welcome back! Wonderful colors and composition. I love that one lone folded umbrella. Hi Clueless in Boston! Nice shot. 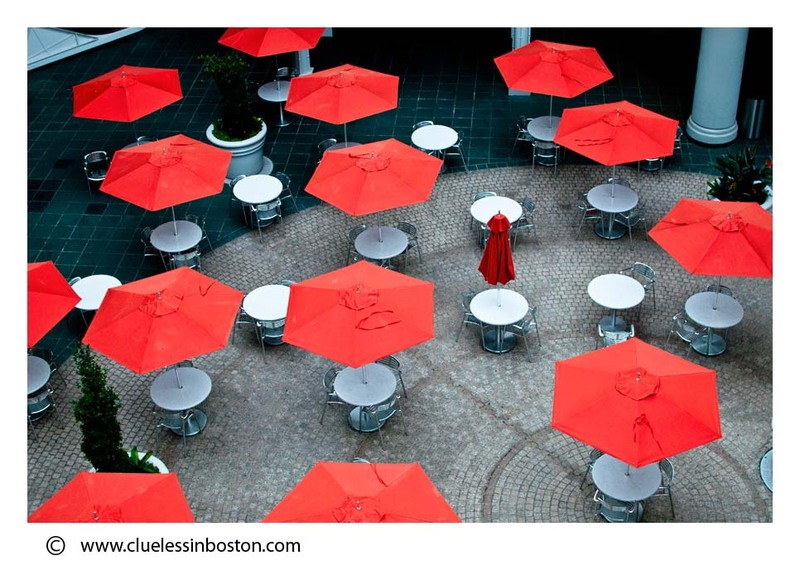 I bet you folded down that umbrella amidst the others just for the picture (smiles). What a super capture. The tension comes from the one umbrella which is down. The image just pops with animation and color. Coooool! Even the single closed umbrella is just perfect in this scene. Now we know where you had disappeared! Glad to see you back in Blogland! You made a wonderful shot, L.A. inspired you! I know it's a great shot when I want and need to come back and see it again and again!! PS - Now I'm going to have to find the spot. Not too far from here.